Ever heard of it? I hadn’t until I became a civil celebrant! With Celtic roots, it dates way back, linked to Neopagan wedding ceremonies. Late old English refers to the verb ‘to handfast’ meaning to formally promise, or make a contract and so a formed a marriage rite in which loved ones’ hands were wrapped in ribbon as they ‘tied the knot’ – an expression that we are all much more familiar with! Glastonbury, Stonehenge and the like are the places to do them and full handfastings are very technical and rather complex. 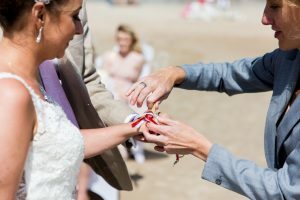 There are many variations and each celebrant will adopt their own style, but a simple handfasting is a really special way of showing unity and commitment to one another. It’s also about the encircling of two hands with a circle symbolising completeness, eternity and infinity with no real start and finish. Interestingly a circle can also depict the unending, the unknowable, the unmeasurable or the ungraspable – many of which can apply to marriage at times too! Different ribbons symbolising various colours are chosen by couples; red for example can signify love, strength and vitality; yellow can represent happiness, pink for unity and romance; and white to mark purity, peace and devotion. The ribbons are then placed and/or tied over a couple’s joined hands, as individual and personalised promises are said and a blessing given.